The largest and most common of these plant-stealing animals is the Lettuce Sea Slug (Elysia crispata), with it's ruffled back looking like intricate leaves of lettuce. It's no accident, these folds allow more sunlight to reach the plant material stored in it's body. 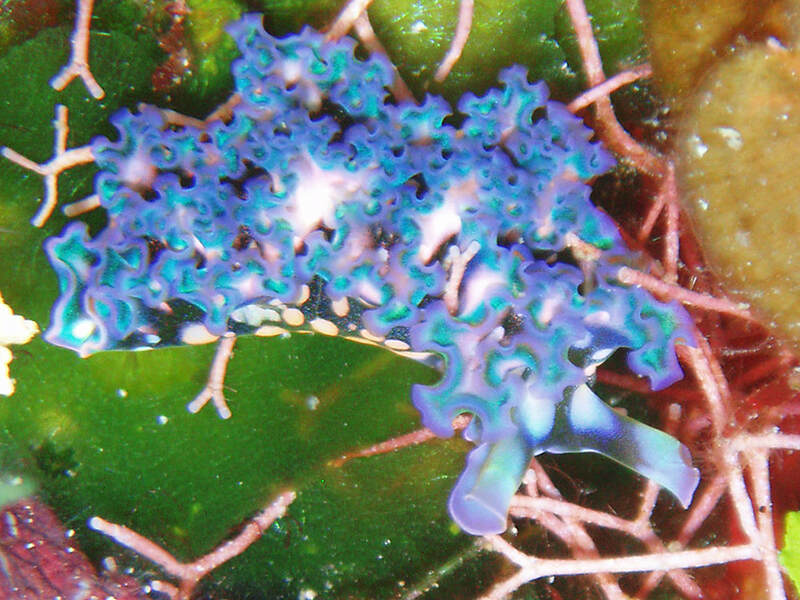 The colors of the Lettuce Sea Slug can change depending on which kind of algae it has been feeding on. As an added bonus, this helps to keep the animal camouflaged on it's food source. When they are very young or haven't fed in a while they have little color and may appear almost white. Inside the mouth is a tiny serrated organ, called a radula, used to saw open the tough walls of plant cells. The contents of the cell are then sucked up and the chloroplasts are saved, either in the lining of the gut or up on the fleshy parapodia so they can be closer to the sunlight. These chloroplasts act like solar-powered batteries and can be kept kept alive and functioning (for up to a month in some species) before they are depleted and need to be replaced. 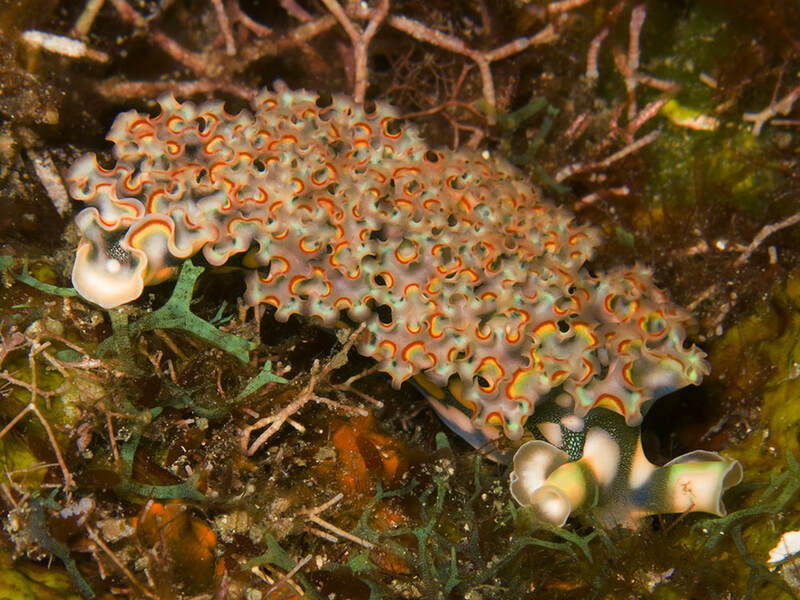 Alage is often overlooked by divers on a coral reef, but it's here that we find some of the most interesting and colorful little animals in the Caribbean. Sap-sucking slugs (or sacoglossans) feed on algae but do not fully digest it. Instead, they keep the chloroplasts alive as a continuing source of food. These tiny plants cells are trapped inside the body, and still produce sugars by normal photosynthesis. Only now they are feeding an animal instead of a plant! This called kleptoplasty, and these are the only animals known to feed in this way. - searchable by page color, Tile-view or Table of contents. Caribbean Reef Life is now into a third edition! Caribbean Reef Life covers the full range of a coral reef’s biodiversity. This expanded third edition is more than just an ID book; it aims to give divers a deeper understanding of these dynamic ecosystems and how different species, including our own, contribute to the reef as a whole. With more than 200 new species included, the third edition has over 1500 reef inhabitants identified and described, including color varieties, growth patterns and different life stages for many species. An essential companion on any diving trip, Caribbean Reef Life covers all aspects of a coral reef ecosystem, from Marine Plants, to the Sponges and Corals, Invertebrates, Reef Fishes, as well as the Marine Mammals and Turtles, all in one book. Look for this symbol throughout the book to find interesting facts about coral reefs, observations on behaviors such as hunting and feeding strategies, reproduction and life cycles, symbiosis and more. Photography Courses Are Now Available! Mickey Charteris is now teaching his own specialised underwater photography courses on Roatan! 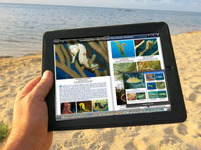 Blackwater Dives now in the Caribbean!